The mortar and pestle set is a handy tool that many Pagans - and other folks - use for grinding and blending herbs and dried ingredients together during a magical working. The set consists of two pieces - the mortar, which is typically a bowl, although it can be flat as well, and the pestle, which is held in the hand. The wide end of the pestle, which is shaped a bit like a baseball bat, is often roughened to aid in the grinding and crushing of herbs, resins, or whatever else you may be working with. Interestingly, the use of the mortar and pestle ties into early herbalism by way of the pharmacy world. The University of Arizona College of Pharmacy says, "The history of the mortar and pestle is closely connected to that of pharmacy. The paired instruments have been used for millennia, dating back to the ancient Egyptians. They are mentioned in the Ebers Papyrus, the oldest surviving medical document, and even in the Old Testament (Numbers 11:8 and Proverbs 27:22)... Throughout recorded history, mortars and pestles have been used for medical preparation. Compounding was an important skill, vital to the practices of pharmacy and medicine. Compounded medications were “made from scratch,” personalized to suit the needs of a patient. A pharmacist would grind appropriate ingredients with a mortar and pestle to create a specialized compound." Most civilizations throughout time have used some sort of grinding and crushing tool to prepare herbs, grain, and other items for consumption. Native American tribes often incorporated flat stones into food preparation, using them to crush seeds, grains, nuts, and more. In some parts of Asia, a stone and a wooden paddle are the preferred method of grinding meat for kebbeh, and both the Romans and Egyptians used a mortar and pestle type tool to prepare medicinal concoctions. Kate Angus of The Atlantic points out that some version of this tool has been around for about ten thousand years. She says, "Throughout their long history, mortars and pestles have varied dramatically in size, style, and material depending on their purpose. Chemists and pharmacists, for example, have traditionally used small porcelain sets for trituration, the process of grinding chemical compounds. In parts of the Middle East, meat is pounded into kibbeh in mortars two or three feet wide. The Chalon and Mutsun people in California’s Salinas Valley ground up acorns and grains by carving shallow depressions into bedrock. In Papua New Guinea, pestles are often carved into elaborate birds’ heads; the Taino, an indigenous tribe in the Caribbean, used small figures endowed with enormous phalli. Still, the essential elements of design remain the same: a bowl and a club, used to crush and grind." In Europe, the design we know today as the traditional mortar and pestle set appears to have been in use since around the fifteenth century. Apothecaries and herbalists used them to grind plants and resins, and cooks included them as part of their regular meal prep, crushing spices, herbs, and other ingredients. Place your herbs, spices, or other dry goods into the bowl and hold it steady with one hand. Using the other, hold the pestle. By pressing the pestle down into the mortar, and moving it back and forth, you can grind and blend the herbs or other items for spellwork. This is a great tool to use if you're using dried herbs which may be in large pieces. It also works nicely with fresh herbs, because the grinding motion of the pestle will help release essential oils from the leaves. 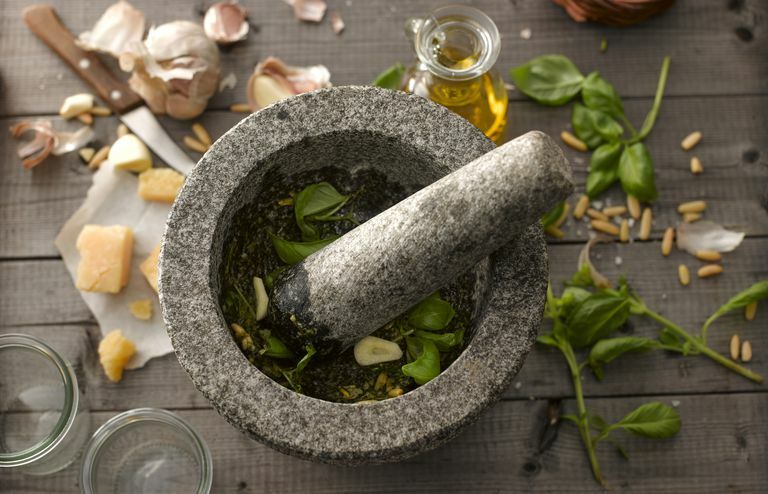 If you're going to start using a mortar and pestle, it's a very good idea to have two different ones - this way you can use one exclusively for herbs and items that may be toxic, and the other for edible materials. Mortar and pestle sets come in a variety of materials, and you can usually find one in your local kitchen supply store. They are available in porcelain, wood, marble, and even metal. In South America, a large porous stone called a molca jete is used to grind grain and vegetables. They're fairly good-sized and wide - if you're working with large items such as corn or wheat, consider using one of these instead of the smaller mortar and pestle.